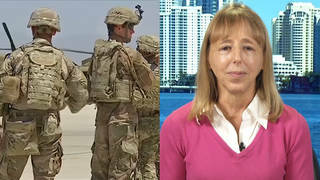 Doctor Who Treated Thousands of GIs Wounded in Iraq: “Severest Form of Injuries I’ve Seen in My Career” | Democracy Now! We speak with Dr. Gene Bolles who for the last two years served as the chief of neurosurgery at Landstuhl Regional Medical Center–the largest hospital outside the U.S. for troops stationed in Europe and the Middle East–about what is not frequently discussed in the mainstream media: wounded soldiers. In the latest news from Iraq, six Iraqis and a US soldier were killed in a massive car bomb outside the headquarters of the US occupation authority in Baghdad. Following the bloodiest month for US troops since the beginning of the invasion, the total number of American soldiers killed in Iraq has now topped 760. U.S. authorities have not bothered to count the Iraqi dead, but some estimates put the number as high as 11,000. News reports and Pentagon briefings emerge daily announcing the death of U.S. soldiers in Iraq. But what is rarely heard in the U.S. media or from the Defense Department is the number of U.S. soldiers wounded. Some figures that have been briefly mentioned in the press fall in the range of two to three thousand. But in a story that received little national attention, the Pentagon reported last month that the military made over 18,000 medical evacuations–representing 11,700 casualties in the first year of war in Iraq. Nearly all those wounded US soldiers ended up in a US military hospital in Landstuhl, Germany for treatment. Today we speak with a doctor who has treated many of those casualties, Dr. Gene Bolles. Dr. Gene Bolles, neurosugeon from Boulder, Colorado. He was hired as a private contractor after the 9/11 attacks to serve as the chief of neurosurgery at Landstuhl Regional Medical Center, the largest hospital outside the U.S. for troops stationed in Europe and the Middle East. He returned from Landstuhl after more than two years treating wounded US soldiers. Bolles was the surgeon who repaired the broken back of Army Pfc. Jessica Lynch after her rescue as a prisoner of war in Iraq last April. Mark Benjamin, UPI Investigations editor. He has been closely following the hidden US casualties from the Iraq war. He was awarded the American Legion’s top journalism award for 2004 for his reporting last fall on the plight of hundreds of sick, wounded and injured soldiers at Fort Stewart, Ga.